From the Caves of Nerja, through the Sanguino stream, this waterfall springs forth to a 15 meter fall to meet the sea below with an impact that stuns our senses. To enjoy it, one must view the waterfall from below: kayak between the cliffs, row through the narrow passages, feel the power of the waves below the vessel, or swim. This is one of the secret places that the Natural Park of the Acantilados de Maro-Cerro Gordo hides. Sea and mountain hand in hand, creating landscapes that stimulate Your imagination. 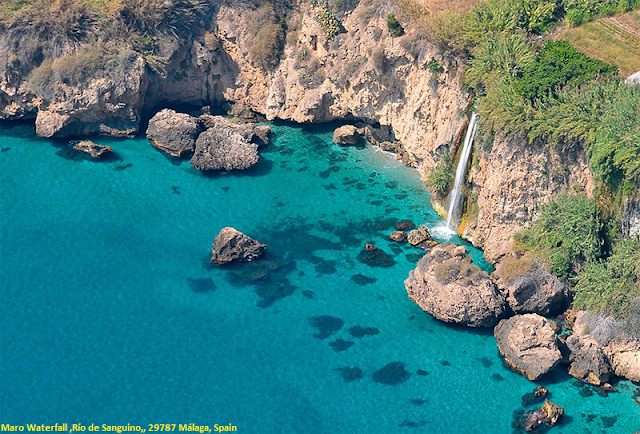 The best panoramic view of this waterfall is from the sea. You can get closer to the cliffs of Nerja and to its rocks that seem to be falling down, and you can get nearer to unbelievable places washed by waves. Torrents of freshwater drop of its cliffs right into the salty Mediterranean Sea. Behind a giant rock, Maro Waterfall (la Cascada de Maro) falls down from an altitude and drops roughly into the sea. Therefore, approaching it in a kayak or canoe, and going through these imposing torrents while getting splashed by water is an incredible experience.